The 1963 JMI Vox amplifier catalog introduced the Foundation Bass enclosure by stating that "The trend is towards the full round string bass sound." Designed for one 18" speaker, the Vox Foundation Bass cabinet was popularized by such groups as the Rolling Stones and the Dave Clark 5. The 1x18" Foundation Bass enclosure is now manufactured exclusively by North Coast Music and authorized and licensed by Vox Amplification, Milton Keynes UK. 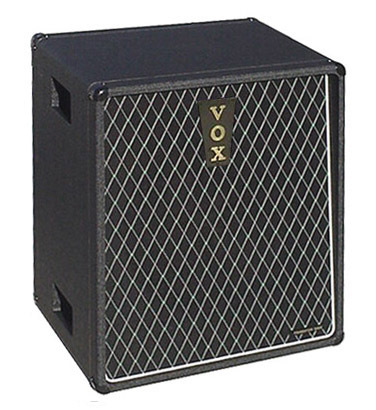 At just 26" tall, 22" wide and 15.5" deep, the Vox Foundation Bass enclosure was barely large enough to enclose an 18" speaker. Like the original JMI Vox model, the sealed, close backed North Coast Music reissue Foundation Bass enclosure is constructed of 3/4" 13 ply baltic birch covered in black basket weave vinyl. The cabinet is available in your choice of brown or black Vox grill cloth. A vertical JMI style Vox logo with gold plated letters (NCM-027) is located at the top of the grill panel. A "Foundation Bass" flag is included on the lower right corner of the grill panel. The reissue Foundation Bass cabinet by North Coast Music also features eight "one-pin" corners, four original style Rean "pancake" feet and a three pin speaker connector on the back panel. Rather than mounting handles to the sides of the cabinet, JMI Vox provided "grip" access holes on the sides of the cabinet. The North Coast Music reissue Foundation Bass recreates these handle grips. Reissue 1x18" Foundation Bass Speaker Enclosure, Less Speaker - The Vox 1x18 Foundation Bass enclosure is now manufactured exclusively by North Coast Music and authorized and licensed by Vox Amplification, UK. The sealed, closed back enclosure includes a cut out for one 18" speaker. All 3/4" 13 ply baltic birch construction, half lap joinery, bolted baffle, "H" pattern vinyl, your choice of black or brown reissue Vox diamond grill cloth, one pin corners, correct nameplate, correct "Foundation Bass" model nameplate in lower right corner of grill, and a a twin lead 20" long speaker wire on an original style Switchcraft 3 pin jack. The cable needed to connect your speaker cabinet to your amp head is available by clicking here. Also included is the speaker mounting hardware. We recommend that you load this cabinet with an Eminence Omega Pro-18A cast frame woofer which is available directly from Eminence, Parts Express or other suppliers. Please note that due to issues with frame size and the diameter of the bolt hole circle, JBL speakers do not fit in this enclosure.